We create Custom Invitations for all Occasions, from Design to Print. Sweet Sixteens, Bar/Bat Mitzvahs, Birthdays, Bridal/Baby Shower, Baby Reveals, Save-The-Dates, Engagement Parties – whatever your special occasion may be. 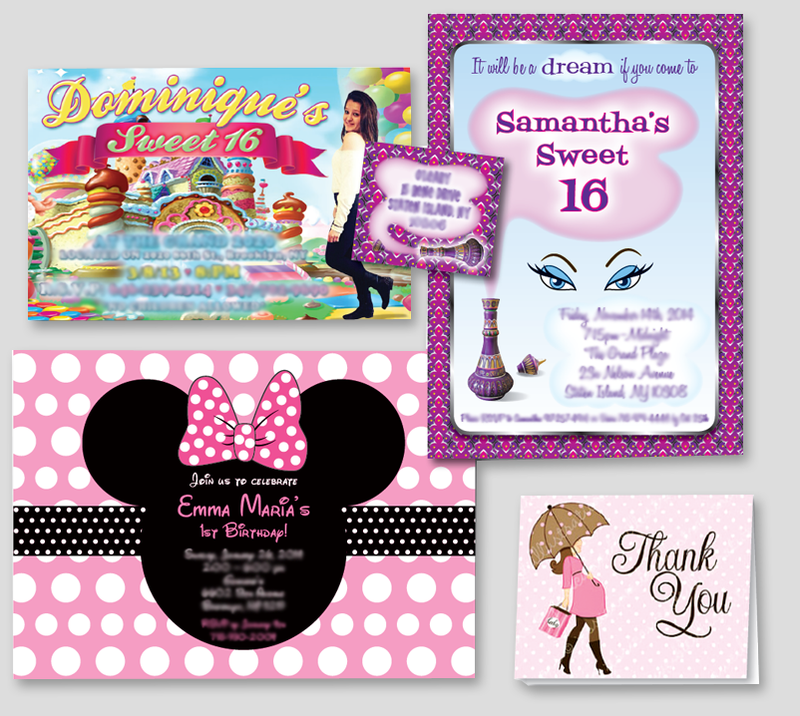 We specialize in themed invitations,and can customize your invitation to accommodate your party motif. Need help coming up with an idea for your your party? We can help with that as well. Our graphic designers are on-hand to guide you through the process. Together, we work to make your party-planning process as easy and cost-efficient as possible. Stop by either of our 2 convenient locations to view our custom samples, as well as our Carlson Craft and Birchcraft personalized invitation books. Thank-You Notes, Return Address Labels, Invitation Bands, Sticker Seals, Banners, Back Drops, Signs, T-Shirts/Sweat Shirts, Candy Wrappers, Poster Pictures, Wall Stickers, Personalized Table Seating Boards, Picture Boards, Candy Jars, or personalize your own “Life-size Removable Adhesive Wall Cut-Outs”… let us personalize it, and make your special event unique and memorable.